The Husqvarna All-Wheel Drive family of mowers allows the user to easily handle hills, thick grass and tough terrain. All-wheel drive technology provides simultaneous power to all 4 wheels giving the operator maximum control and maneuverability. These rugged mowers feature a heavy-duty steel deck and powerful engine options. 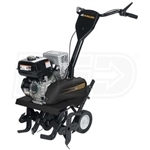 The HU725AWD features a Briggs & Stratton engine, 22" cutting width, comfort handle and a 2 bushel soft bag collection system. Equipped with heavy-duty steel cutting decks and easy-start engines, the HU700H features collection, mulch and side discharge, offering you added versatility in terms of mowing frequency and cutting results. Rugged ball-bearing wheels, with high wheels in back, ensure a smooth run and minimized play, even after many years of use. Variable drive speed allows you to adjust the speed according to your needs and the condition of the lawn.